The purpose of risk management in projects is to reduce the uncertainty that an organisation might not achieve its project objectives and to identify and take advantage of opportunities for improving desired outcomes. In particular, risk management assists all those involved in projects in setting priorities, allocating resources and implementing actions and processes to manage risk more effectively and more efficiently. The Broadleaf team all have many years of experience working with important projects, in a wide range of sectors around the world, and addressing many aspects of project uncertainty for both owners and contractors. We have worked with project directors, project managers, project teams, peer reviewers and those who must approve large capital investments. Our activities have covered all stages of the project life cycle from the earliest concept development through to project delivery and handover to operations. Our work includes qualitative risk assessment and risk treatment planning, the development of project risk management frameworks and risk management plans, quantitative analysis of cost, schedule and investment uncertainty, and project risk management training. 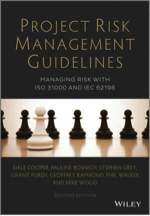 Our book, Project Risk Management Guidelines: Managing Risk with ISO 31000 and IEC 62198, was published by John Wiley in 2014. This case describes the implementation of risk management for a project to remediate and upgrade an urban reservoir. It demonstrates a continuing project risk management process, with a focus on regular risk assessments, formal risk treatment planning, sound monitoring and review, and a project risk management plan that is comprehensive and kept up-to-date through the life of the project. Project framing is an important value improving practice. This case describes how project framing was conducted for a large resource project. Exploring the strategic options, and their associated risks, allowed the project team to concentrate its efforts on those aspects of the pre-feasibility study where strategic decisions were required and where reducing uncertainty would best contribute to those decisions. We were asked to assist in the post-investment review of a large oil and gas development that had started operation. We conducted root cause analyses to understand how the investment performed in relation to the expectations set at the time it was approved, extract lessons and develop actions that would lead to improved outcomes in future investments. A joint venture consortium was considering whether or not to proceed to a full evaluation and a commercial bid for the development of a coal resource and a long-term coal supply agreement. This would have required a significant investment of time and resources by the JV partners. We helped them examine the issues surrounding the bid and its commercial implications before they committed themselves. We helped ADGAS develop its ERM framework, corporate risk register and treatment plans.